bell pepper rice recipe - easy, quick and delicious one pot capsicum rice recipe. 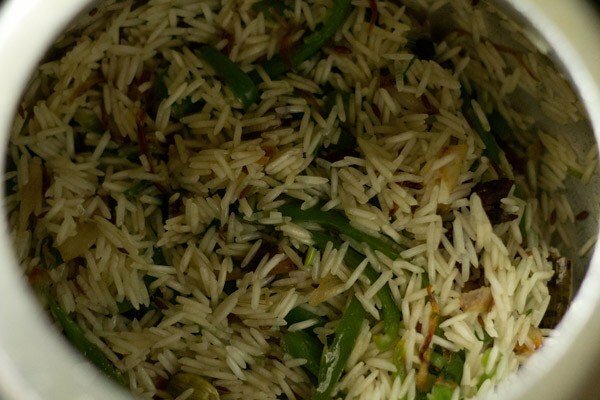 capsicum rice recipe with step by step pics. 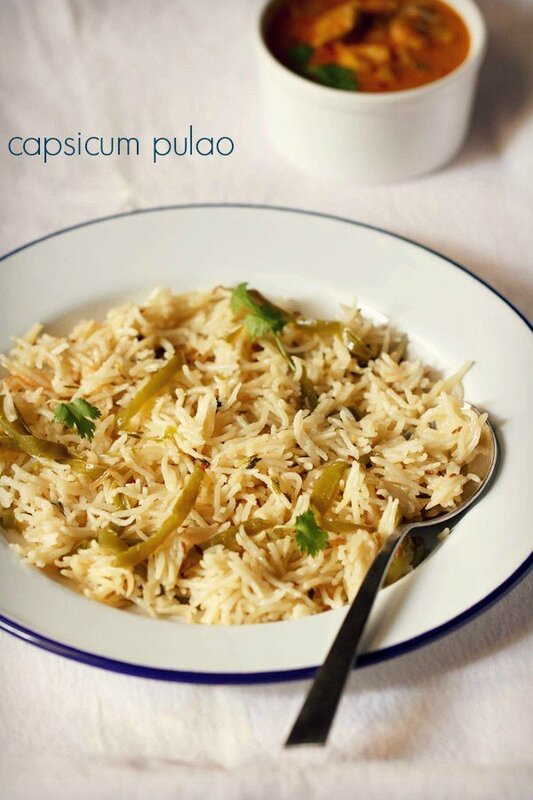 this is an easy, quick and delicious one pot capsicum rice or capsicum pulao recipe. 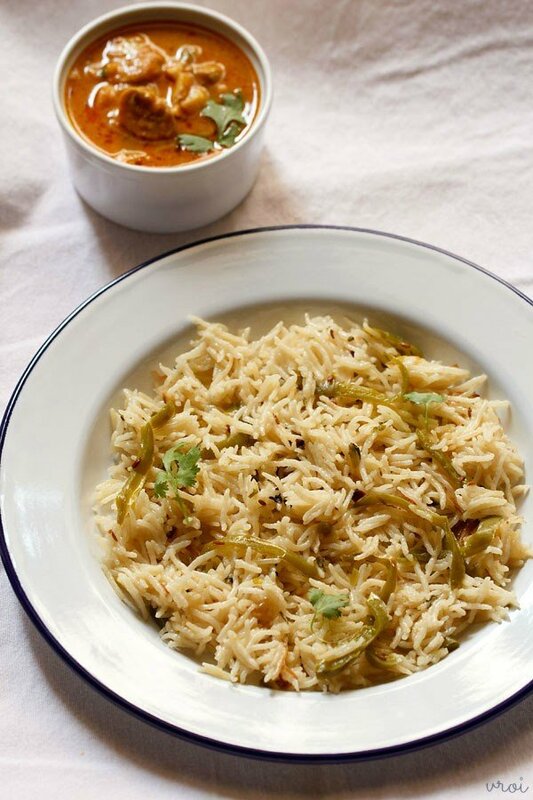 for those who like capsicum or bell peppers, here’s an aromatic pulao made with green bell peppers, spices and rice. 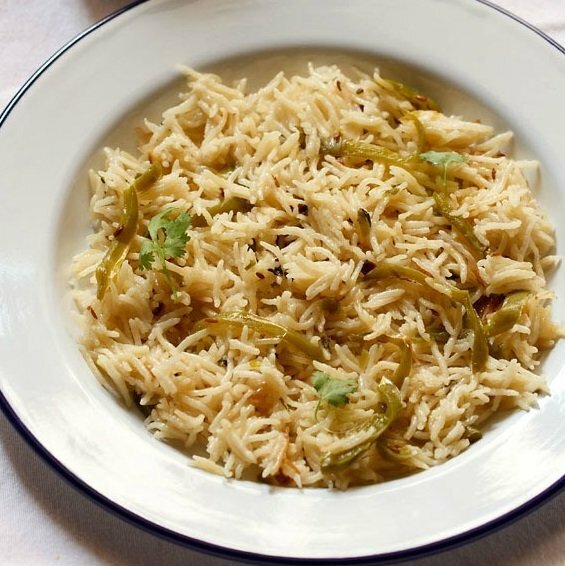 this is a mild pulao and so goes well with kids or folks who do not prefer spicy food. 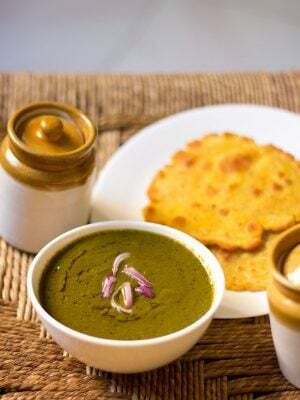 can also be packed in the tiffin box with a side dal or gravy dish or chutney. 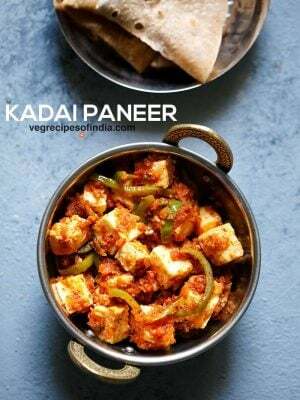 there are not many ingredients used in the recipe and thus this capsicum rice goes very well with a side vegetable or paneer gravy, dal or even a simple onion-tomato raita. i also make a spicy version of capsicum rice and i will share this recipe too. apart from green bell peppers, you can also use red or yellow bell peppers or even a mix of all three. 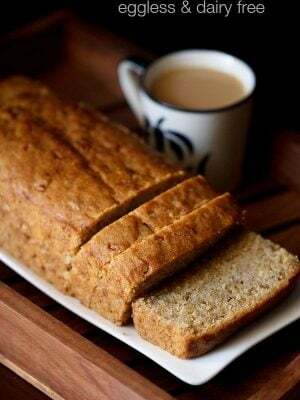 you can add additional veggies like carrot, green peas, cauliflower or potatoes in the recipe. 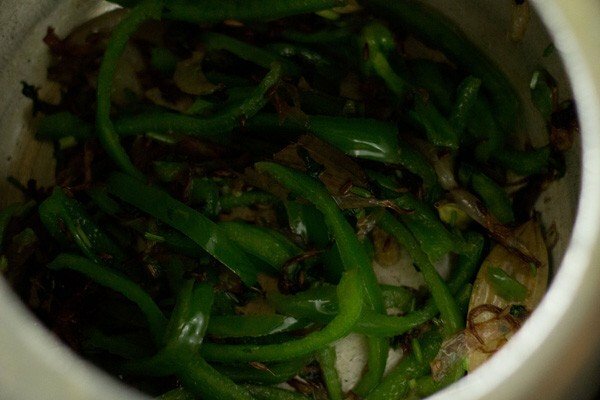 this will not only add more flavor but will also increase the nutritional content in this capsicum rice. 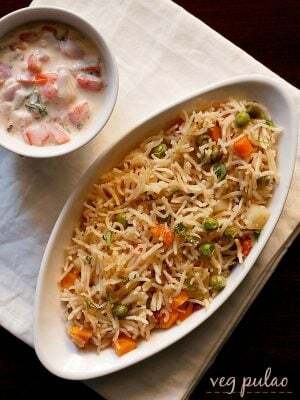 but then it will be more like a veg pulao however will taste good and will be healthy. rinse 1 cup basmati rice very well in water. 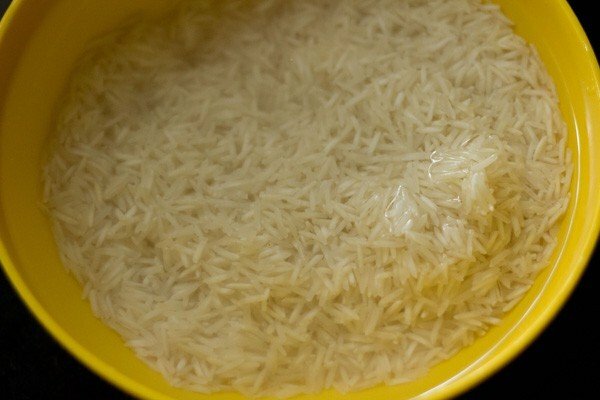 then soak rice in water for 30 minutes. later drain and keep the rice aside. meanwhile when the rice is soaking, slice the onions thinly. also slice the capsicum. heat 2 tbsp oil in a pressure cooker. add the whole spices - cumin seeds, green cardamoms, cloves, inch cinnamon, tejpatta, strands of mace. saute till the spices crackle and become fragrant. 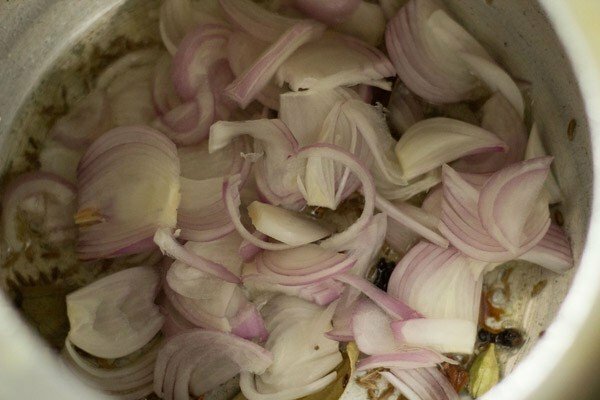 then add the sliced onions. 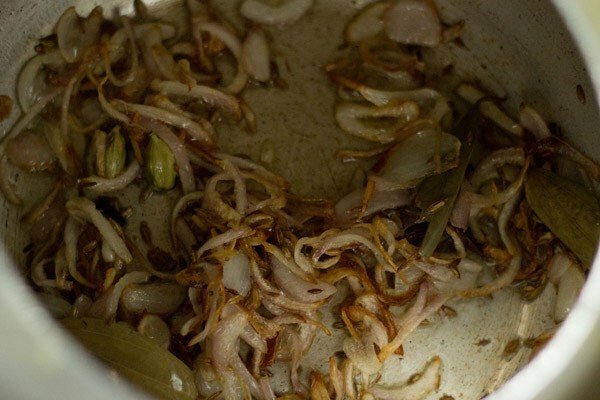 stir very well and saute till the onions become golden. 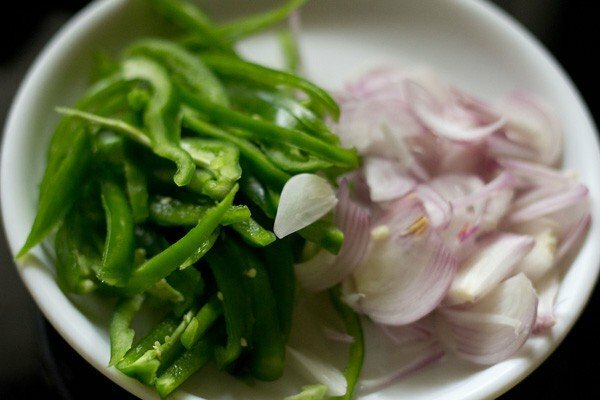 now add the sliced capsicum and chopped coriander leaves. stir very well and saute for 3 to 4 minutes. add the rice. stir and saute for a minute. pour water and season with salt. also add 3 to 4 drops of lemon juice. stir. cover the pressure cooker with its lid and pressure cook capsicum rice on a medium to high flame for 2 to 3 whistles. when the pressure falls down on its own, open the lid and gently fluff the capsicum rice. 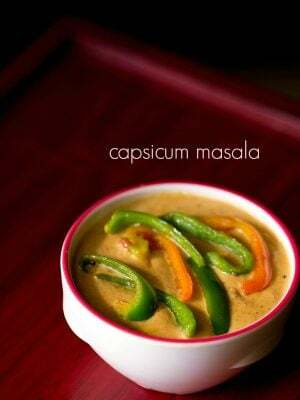 serve capsicum rice hot with some curry dish or a dal. 1. rinse 1 cup basmati rice very well in water. 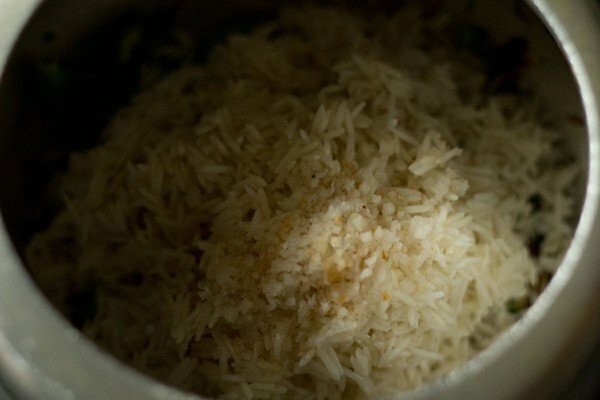 then soak rice in water for 30 minutes. later drain and keep the rice aside. 2. meanwhile when the rice is soaking, slice the 1 medium onion thinly. also slice 2 medium capsicums. keep aside. 3. heat 2 tbsp oil in a pressure cooker. 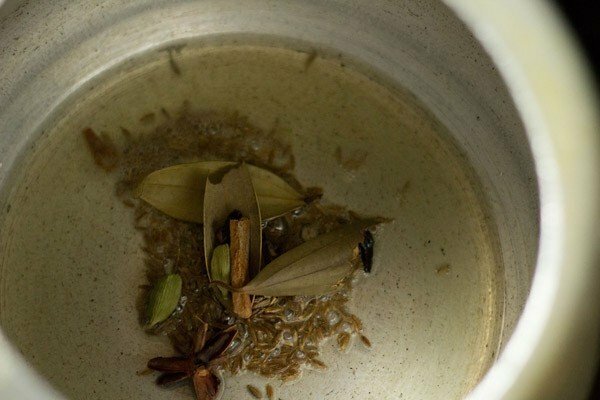 add the whole spices – 1 tsp cumin seeds, 2 green cardamoms, 2 cloves, ½ inch cinnamon, 2 small tejpatta or 1 medium to large tejpatta, 2 single strands of mace. saute till the spices crackle and become fragrant. 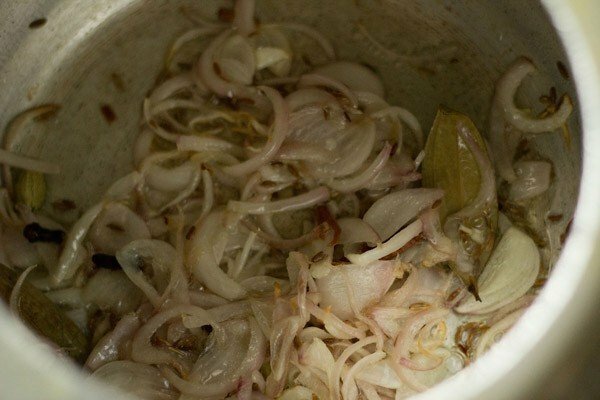 4. then add the sliced onions. 6. saute till the onions become golden. 7. now add the sliced capsicum. 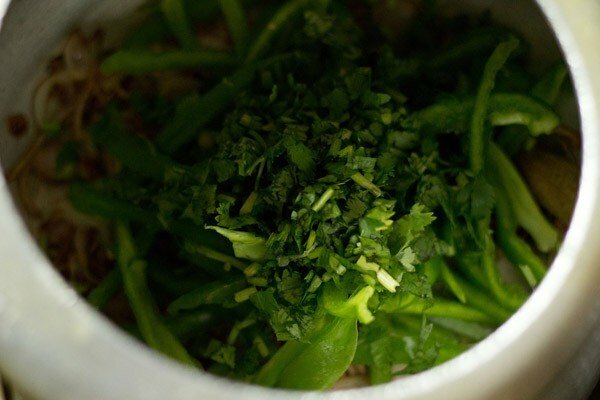 8. add 3 tbsp chopped coriander leaves. 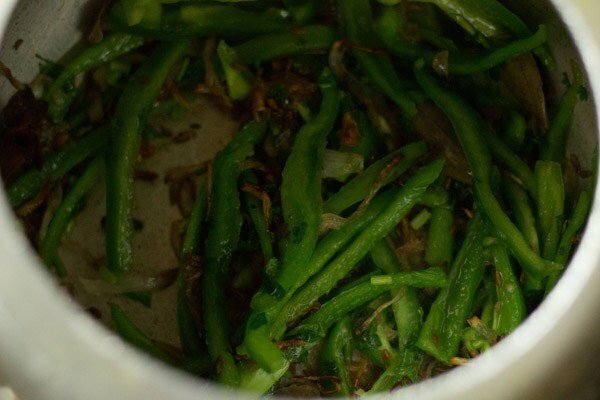 10. saute for 3 to 4 minutes. 11. add the rice and salt. 13. pour 1.75 cups water. 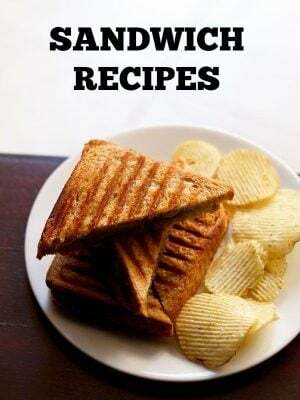 also squeeze in 4 to 5 drops of lemon juice. stir again. 14. cover the pressure cooker with its lid and pressure cook capsicum rice on a medium to high flame for 2 to 3 whistles. 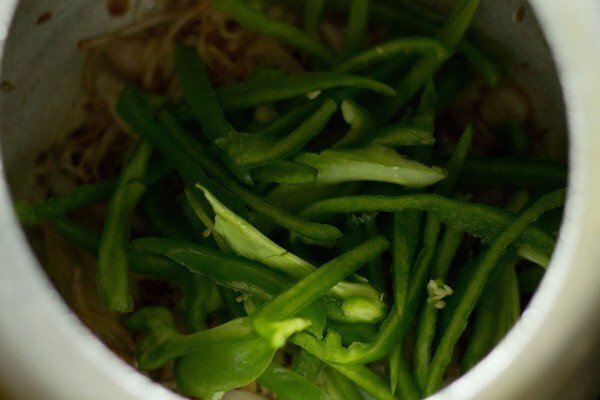 when the pressure falls down on its own, open the lid and gently fluff the capsicum rice. i pressure cooked rice for 3 whistles. depending on the type of rice, you can add 1.75 to 2 cups water and pressure cook for 2 to 3 whistles. 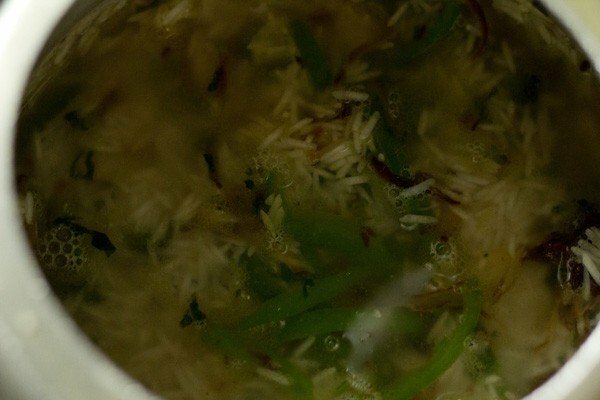 you can also make the pulao in a pot. add water accordingly if making the capsicum pulao in a pot or pan. 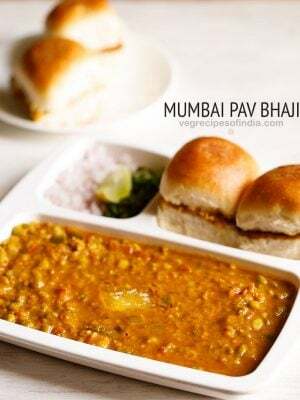 15. serve capsicum rice with some curry dish or a dal. 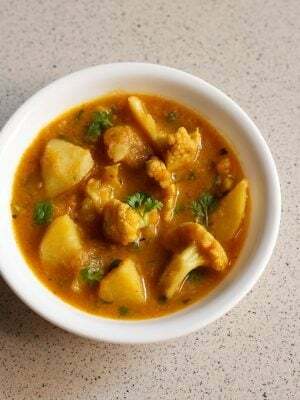 i served with mushroom masala. sush, depending on the quality of rice, you can easily add 1.5 to 2 cups water for 1 cup of rice which has been pre soaked for 30 minutes. while cooking in a pressure cooker also you can add upto 1.5 to 2 cups water for 1 cup of presoaked rice. for an aldente texture in rice, 1.5 cups water is fine, but if you want the rice to be more on the softer side, then add 1.75 cups rice. usually i add 1.75 cups water for 1 cup of organic basmati rice or even regular basmati rice which has been presoaked for 30 minutes. 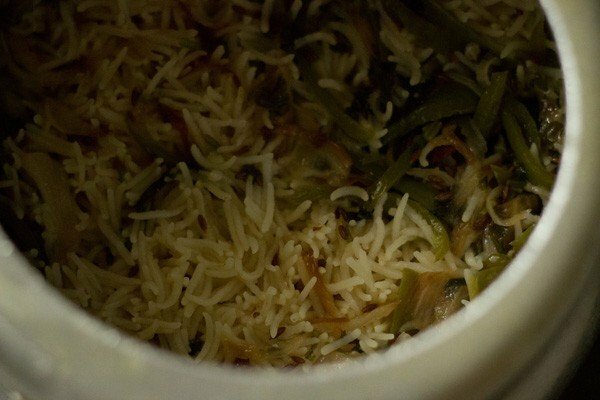 in biryani and pulao, the rice is cooked well but it should remain separate, whereas in usual cooking of rice, it can be cooked more.